I know I’ve been absent from here for a little while (again) but it’s because I’ve been busy (not lazy!) – I’m going to take the next several posts to bring this record up to date. 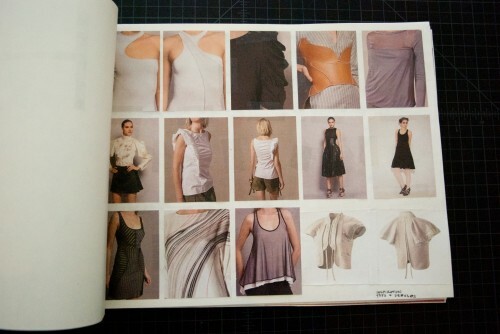 First up, my concept book. I decided some weeks ago that I really needed to delineate the focus of my line – I had so many ideas that were going all over the place, and I was having a hard time organizing and editing. So I took about a week to really comb through all the material (inspiration and ideas) I had generated. 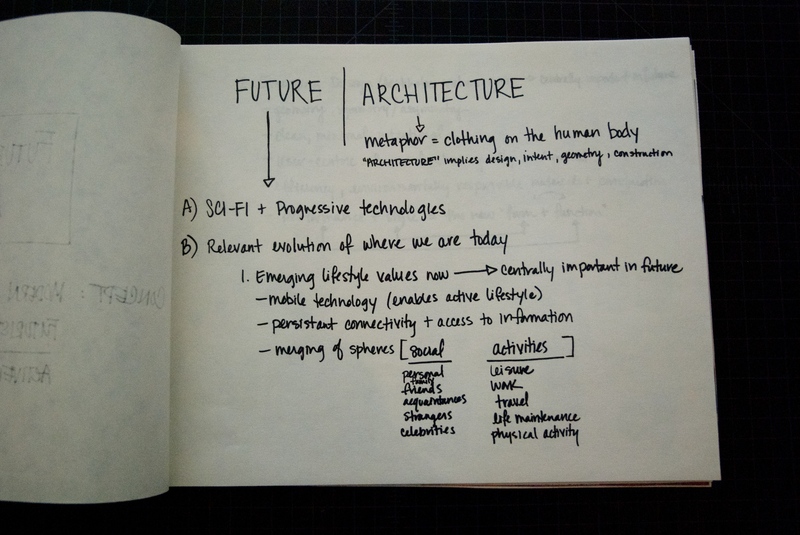 I organized everything into a concept book, being very selective about what I included in it, so that it would show a clear point of view and be full of only valuable information. I am calling my line (for now) Future Architecture, which holds a lot of meaning (I’ll elaborate on the name later) and helps me make appropriate design decisions. In the first few pages of the book, I broke down this title and clearly outlined the concept of the line, including why I feel this concept is relevant. 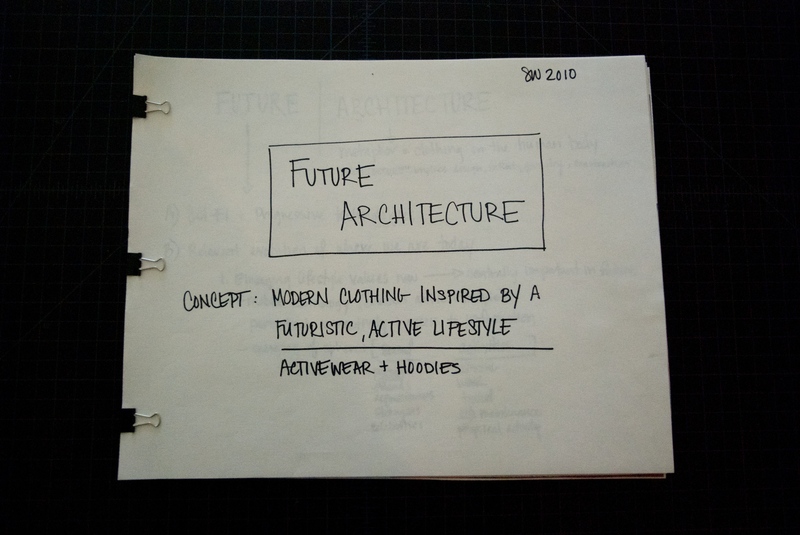 I want to take the “activewear” idea I had previously and grow it into something that has both functional and aesthetic appeal. 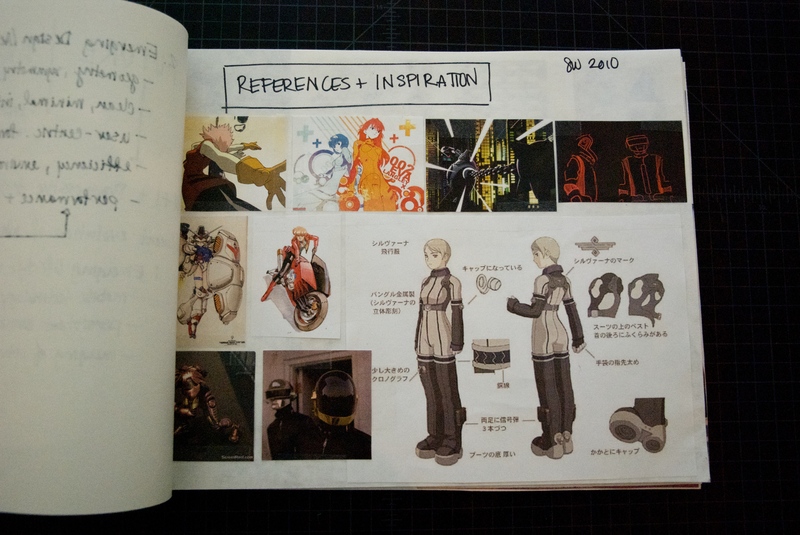 The next section is a collection of visual references and inspiration that I feel is valid for this concept. I was particularly selective here, as I wanted to build a clear picture of where I’ll be going with my designs. 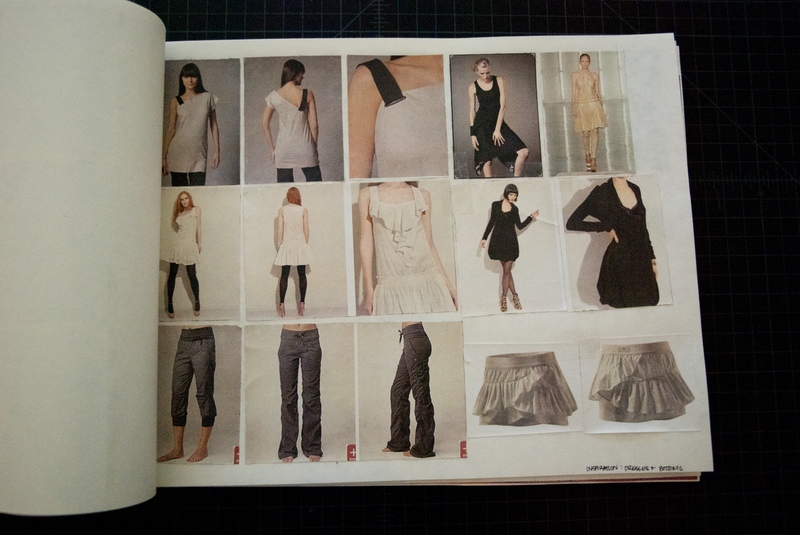 It was also really important for me to organize the images into groups (per page) because each page represents a visual concept or theme that will appear in my final designs. The first page is about mobile/active utility wear through the visual language of sci-fi and anime. 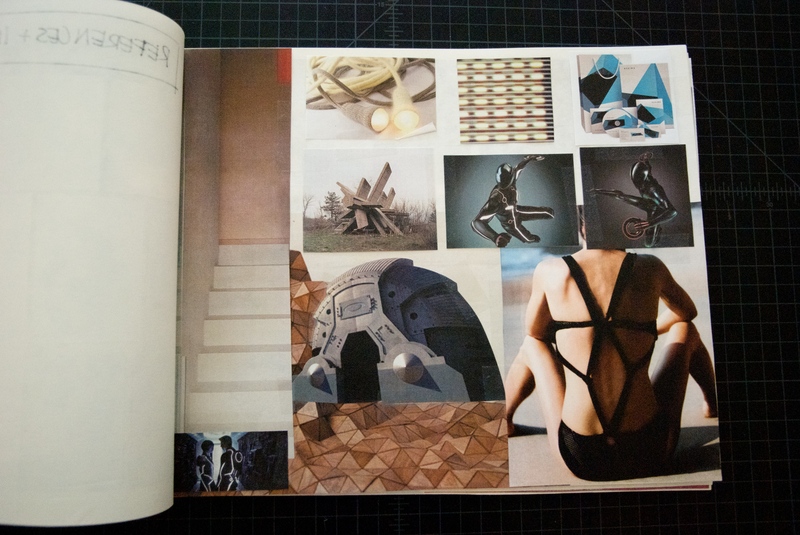 The next page is about geometric elements used in an architectural, structural way. Then I included some inspiration pulled directly from existing apparel. I picked these specific pieces as examples of how I see the above concepts already being expressed in clothing presently. 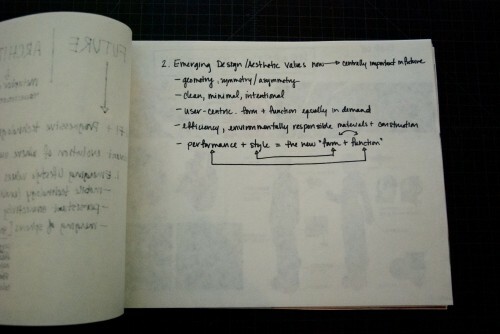 Next I did a study on who I’m designing for: my user. First, I explored her physicalilty as preparation for how she will be illustrated in my final designs. In fashion illustration, the figure’s pose conveys the personality of the clothing, so I will show her in a dynamic, direct, active pose. I also explored her spirit – I collected the images of iconic women (real and fictional) whose personality traits could merge into a strong, active, fearless adventurer. 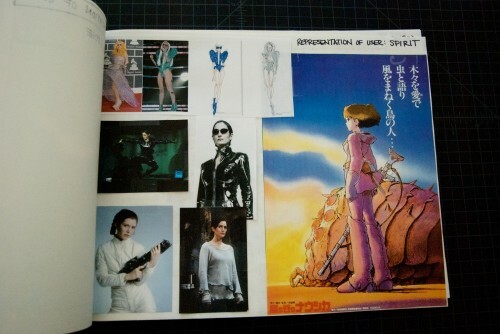 I included Lady Gaga, Princess Leia, Trinity from The Matrix and Nausicaa from the anime, Nausicaa of the Valley of the Wind. 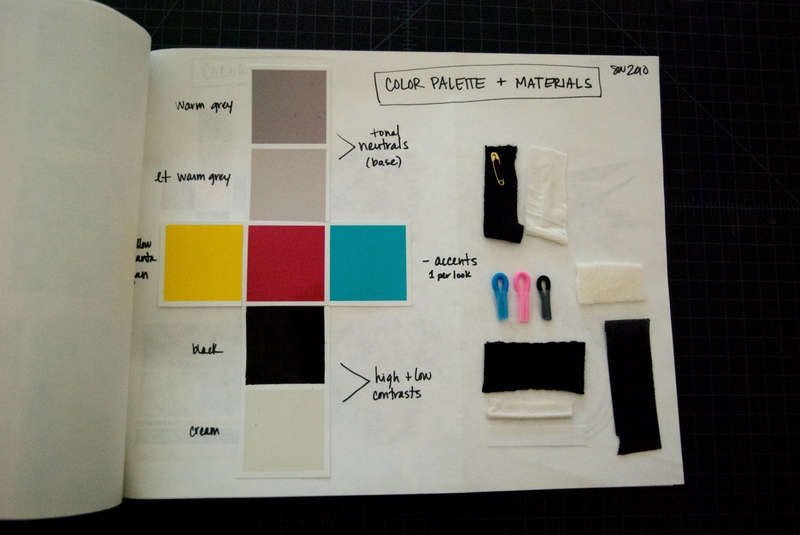 Next I outlined the color palette I will use and some of the materials I will use. The materials section is still in progress while I hunt down the right fabric. 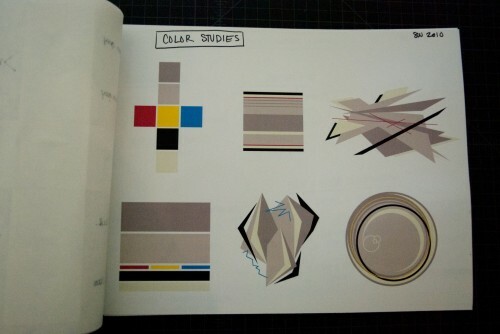 The color palette is mostly neutrals with black and cream (in place of bright white), and 3 accent colors, one per look (I’m working towards 3 looks, initially). The way I had represented the color palette (each color an equal sized square) was a bit misleading to look at, so I did a page of color studies that show more accurately how I will be using color across each look. You can see from these studies that the neutrals will be most prevalent, and the accent colors will be spare and deliberate. Then I drew up a game plan – I will create 3 looks (initially), each intended for a different level of activity (low, medium and highly active) and attribute the accent colors accordingly. 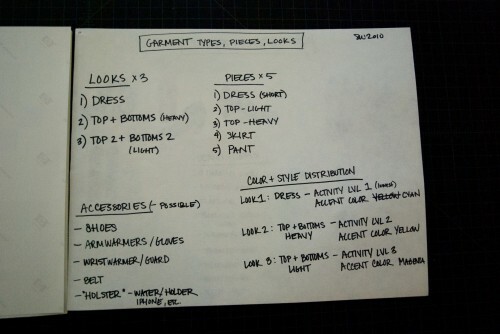 The first look (low activity) will be a dress, the second will be heavier outerwear type top and bottom, and the third look (highest activity level) will be a light top and bottom set. 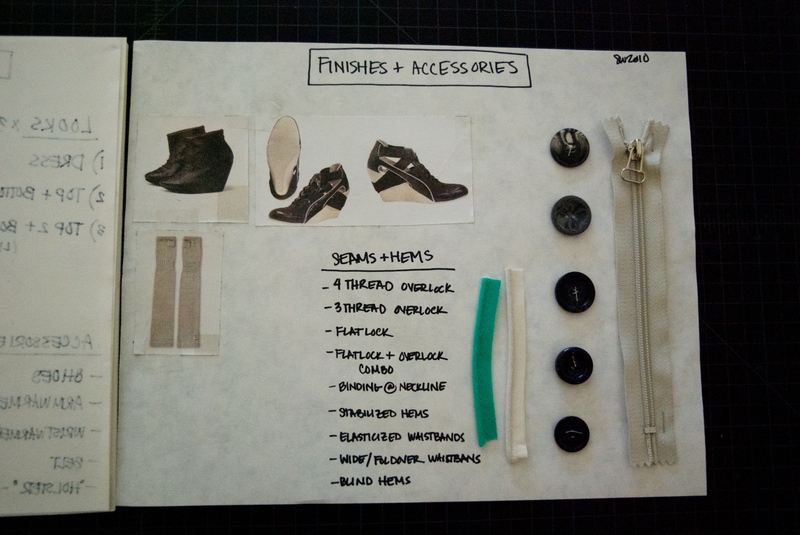 Finally, I put together some inspiration for accessories and started to list out finishes I’ll use. 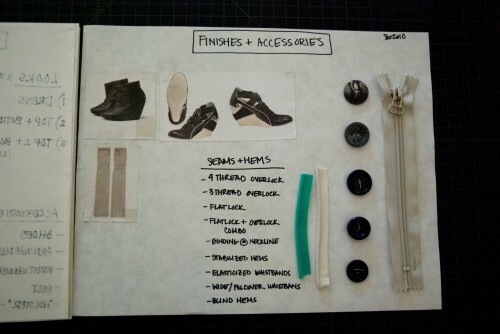 I picked zippers and buttons that fit in aesthetically and functionally. 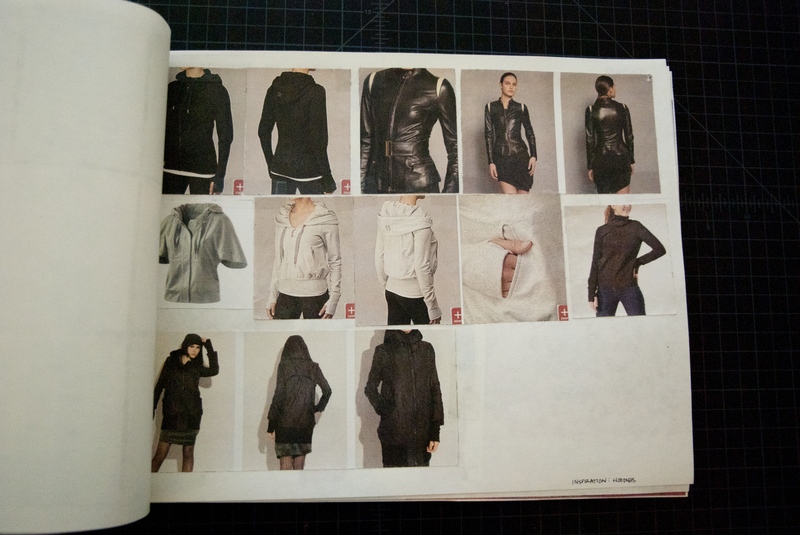 I also listed out hems and seam types I’ll use, they are more suited to activewear and stretch fabrics. I’m finding it helpful to think of these things early on in the design process, because when I’m sketching things out, I’m already in the mindset of things like elasticized waistbands, and can sketch more on target. And that’s the book! It relieves a lot of anxiety to have put it all down on paper. I refer to it often as I’m working on the final designs. When all three looks are complete, I will include my drawings of the final designs and photographs of final pieces as the last pages of the book. Then I’ll have a complete record of my process from start to finish! Good luck, Sister! WOW! Just wish I could wear shoes! i know – those alexander mcqueen puma shoes are pretty amazing! So impressed (as always) with you and with this book! So well thought out and focused. 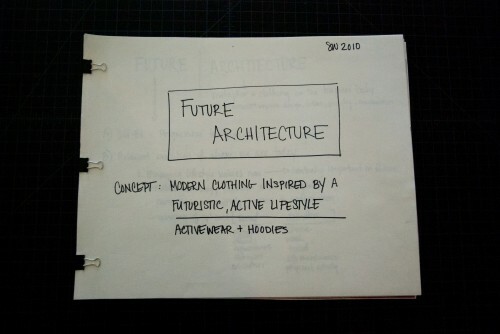 Can’t wait to see the “Future Architect” line! 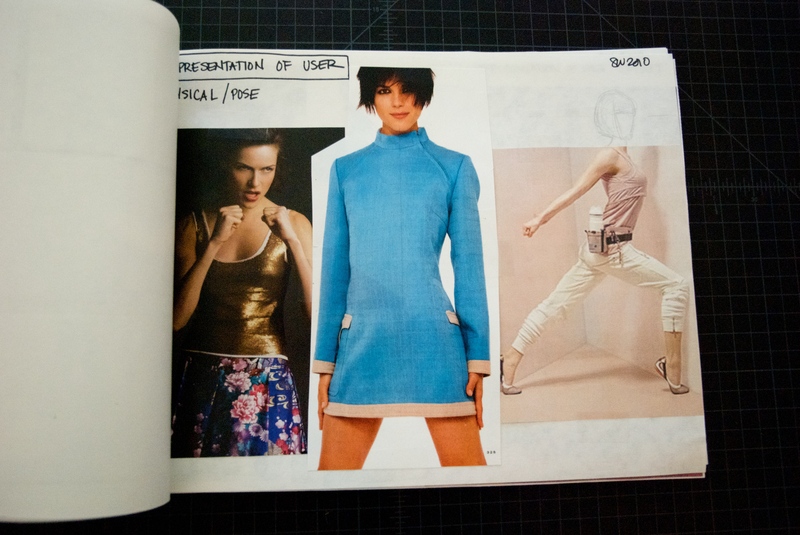 your concept book looks amazing! Love that you are inspired by Nausicaa!! Beautiful work sophy! thanks megumi! i hope our paths cross again someday soon :) best of luck on your amazing film projects!